Sugar, in its various forms is found in practically everything from crackers and breads to dressings, meats, juices, jams, yogurt, nuts, some root vegetables and fruit. “White Sugar” is a sweet additive substance that has become an iconic symbol at birthday parties and a social obligation to every loving parent who wants to bring a smile to their child’s face. Sugary confections are so prevalent in our society that they have become commonplace when celebrating holidays, at gatherings and events. For many of us, serving up a treat is ingrained in us just as much as saying please and thank you. As a result, natural sugar substitutes are growing in popularity as concerned parents seek to dispel the harmful effects of “sugar”. However, the little dark truth many of us do not want to accept, or some do not realize, is that anyway you look at it a sugar is a sugar. The average American consumes about 1/2 cup of sugar a a day. A regular can of soda contains a whopping 9 teaspoons of sugar; the total recommended daily allowance of sugar for men. It is interesting to note that this statistic is not just related to decadent desserts. Anything made with sugar, natural or refined, can have the same effects. Glucose- a simple sugar made by the body through the digestion of carbohydrates. It is the body’s chief source for fuel. Sucrose- common white table sugar. It is highly processed from the sugar cane plant. Devoid of any nutrients. Fructose- highly processed natural sugar derived from fruits, honey and some root vegetables. Fructose is linked to heart disease and high cholesterol; consumption should be limited. Devoid of any nutrients. Crystalline Fructose- highly processed corn starch or sucrose (table sugar). Devoid of any nutrients. High Fructose Corn Syrup- highly processed corn, wheat and rice. Most used ingredient in processed foods. Is linked to heart disease and high cholesterol; consumption should be limited if not avoided. Devoid of any nutrients. Lactose- natural sugar found in milk. Maltose- malt sugar processed from honey, barley, wheat, rice or other grains. Generally used in making beer and as an additive to some processed foods. When carbohydrates are digested, they are broken down into a simple sugar called glucose. Carbohydrates such as fruit, bread, pasta, cereals and sweets are common sources of glucose. Glucose, commonly referred to as sugar, is an important energy source that is needed by all the cells and organs of our bodies especially our muscles and the brain. Glucose is absorbed from the intestines into the bloodstream. A hormone Insulin is then secreted by the pancreas in response to the increase of glucose in the blood. The blood carries the sugar and the insulin to the cells. Most cells have insulin receptors which bind the insulin that is in circulation. Once a cell has attached insulin to its surface, another receptor is activated that will absorb the glucose from the blood to the inside of the cell. Without insulin our cells cannot access the calories contained in the glucose to use as fuel. People with Type 1 Diabetes do not make insulin. These individuals require insulin shots that allows the cells to use glucose for energy. If cells become resistant to insulin, the body will begin to produce more of it to compensate. Insulin resistance happens when cells have been inundated with insulin for so long, that the receptors lose their sensitivity to it. Those with Type 2 Diabetes have insulin resistant cells; meaning the cells are slow to respond to the insulin therefore they cannot effectively absorb the sugar. This causes the sugar to accumulate in the blood thus leading to increased production of insulin. Too much insulin released into the blood stream can upset the blood sugar balance triggering the release of more insulin to bring the blood sugar back to a safe level. This reaction causes a chain of events by rapidly dropping blood sugar levels thus inducing hunger and ultimately promoting the storage of fat making way for rapid weight gain and high-blood pressure. On the flip side, if we starve ourselves the body will in turn attack our muscles, organs and bone tissue to convert proteins into glucose to keep the body going. Just as an influx of glucose can cause a spike in insulin levels, excess sugars in the liver can lead to the production of excess Triglycerides. Triglycerides and Cholesterol are needed by the body to function. Triglycerides are a form of fat in the blood stream that provide the energy needed for cells to function. Cholesterol is used for building cell membranes and making essential hormones. As before mentioned, simple sugars are converted to glucose in the liver. Foods with a high glycemic index* are converted too fast. The overload of sugar in the liver prompt the body to produce more Insulin. Excess calories which have not been used for energy are converted into triglycerides right away. The triglycerides are stored in your fat cells to be released as energy between meals. The more calories we consume the the greater chance of having high triglycerides. High levels of triglycerides can lead to high-blood pressure, high cholesterol, diabetes and heart disease. *The glycemic index is a valuable tool for those with diabetes to help monitor how they eat but can also be used by those looking for alternatives to table sugar. The glycemic index measures how quickly a particular carbohydrate turns into glucose. Foods that rapidly release glucose (dried fruits, white potatoes, candy, enriched breads, rice, sweetened cereals) are high on the glycemic index because they cause a spike in the blood sugar levels. Foods that slowly release glucose (raw fruit, nuts, kidney bean, barley) are low on the glycemic index providing a gradual healthy rise in blood sugar. The rule of thumb is to eat moderately throughout to day to keep the blood sugar from fluctuating too high or too low. A diet of fresh fruits, vegetables, complex carbohydrates and lean proteins in addition to daily exercise will aid in keeping blood sugar levels in check. Most importantly remember moderation in all things is the key. Sugar-free does not mean sugar-less. Sugar-free is a termed used when refined sugar has been replaced by a natural or artificial sweetener. Any use of these powders and syrups are still considered “added sugar” and should be limited. As a side note we all process sugars differently. Some individuals would do well switching over to a natural sweetener particularly diabetics, those with allergies and Celiacs disease to name a few. Use the following guidelines for substituting natural sugar in cooking and baking. Agave Nectar– is a fructose syrup made from a spiky desert cactus plant native to Mexico. It is 1 1/2 times sweeter than sugar so you can use less. Has a minimal effect on blood sugar and insulin levels. Can be used to sweeten drinks and in baking. Agave nectar will not alter the flavors in your recipe as honey or maple syrup might do. When used in baking add the total amounts of sugar and multiply by 2/3. For every 1 cup sugar in a recipe use 2/3 cup agave. You will need to decrease the liquid in the recipe by 2 tablespoons and reduce the temperature by 25 degrees; baking several minutes longer. The herbal supplement containing agave should not be consumed when pregnant, but the nectar is fine. Brown Rice Syrup– has half the sweetness of sugar and tastes vaguely of butterscotch or caramel. Brown rice syrup contains about 13 calories per teaspoon and is less sweet than sugar. Breaks down relatively slow but because it is a derivative of maltose diabetics should avoid using this sweetener as it causes a spike in blood sugar. Rice syrup may be used to make cookies, crisps, granola, pies, and puddings. Combine with another sweetener such as maple for cakes. Substitute each cup of white sugar with 1 1/3 cups of brown rice syrup. As with agave nectar, slightly reduce liquids by 2 tablespoons and the temperature by 25 degrees. Barley Malt Syrup– barley malt syrup can be used as a sweetener with cereals, breads and other dense bread-like baked goods and baked beans. Substitute 1-1/3 cups barley malt for 1 cup white sugar. Reduce liquid by 1/4 cup. Add 1/4 teaspoon baking soda per cup barley malt. Purchase only 100 percent barley malt, not barley/corn malt syrup. Store refrigerated. Maple Syrup– Grade B syrup- is boiled down maple tree sap containing 17 calories per teaspoon. Maple syrup still retains minerals manganese and zinc but is high on the glycemic index making it off limits for diabetics. Substitute 2/3 to 1/4 cup pure Vermont maple syrup for 1 cup white sugar. Reduce liquid in recipe by 3 tablespoons. Add 1/4 teaspoon baking soda per cup of maple syrup. Decrease oven temperature by 25 degrees. Maple Sugar– use in all baked goods. 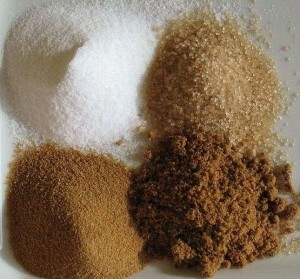 Substitute 1 cup maple sugar for 1 cup white sugar. No reduction of liquid is necessary. Add 1/8 teaspoon baking soda per cup. Store in a tightly closed container and sift before using. Mix with liquid to make glazes. 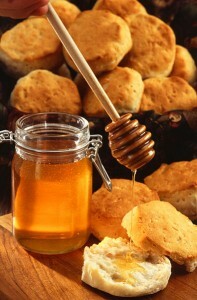 Honey– can be used in almost any recipe. Use to sweetening teas, cereals, salad dressings, in the place of jam, in baking and cooking. Substitute 2/3 to 3/4 cup for 1 cup white sugar. Reduce liquid by 1/4 cup. Add 1/4 teaspoon baking soda per cup honey. Reduce oven 25 degrees and adjust baking time. Children under 1 year of age should not consume raw honey. Honey can affect blood sugar levels and is not recommended for diabetics. Raw honey is considered a superfood and is used as a natural remedy for many health aliments. Processed honey has been stripped of the essential vitamins and minerals and is devoid of any nutritional value. Often high fructose corn syrup is added to processed honey. Erythritol– an ingredient largely found in packaged foods is used in a powder form to sweeten coffees and teas. It is low in calories and does not affect blood sugar or insulin levels. It is the result of breaking down, fermenting, and filtering sugar cane or corn starch until only crystals left. Erythritol won’t decay your teeth however it can cause problems like gas, bloating, and diarrhea. Stevia– is derived from a plant native to South America. Stevia is 300 times sweeter than sugar but is technically not a sugar. Stevia has zero calories, does not feed yeast or cause any of the numerous problems associated with sugar. Some evidence shows that Stevia may help lower blood sugar levels. Stevia is available in liquid and powdered form in the vitamin aisle. You can also grow your own plant, or buy the dried herb. Use Stevia for sweetening plain yogurt, salad dressing, grapefruit, coffee and teas. Stevia may be used in recipes in the place of other sweeteners. Apple Juice– concentrated apple juice is closer to refined sugar than fresh apple juice. Use freshly juiced, no sugar added, in cooking and concentrated apple juice for baking. Applesauce– substitute each cup of sugar with one cup of applesauce, reduce the liquid content slightly. Diabetic friendly. Bananas– has a high natural sugar content. Use to sweeten cereals, baked quick breads such as muffins and pancakes and in the place of jam on a peanut butter sandwich. Prunes– add prunes to sauces, or use real prune juice in marinades and sauces. Date sugar– use in combination with other sweeteners in crisps, granola bars or as a topping. Substitute 1 cup for 1 cup white sugar. Add hot water to dissolve date sugar before using in batters. Reduce temperature as date sugar tends to burn easily. Xylitol– is a sugar alcohol derived from berries or corn cobs that looks and tastes just like sugar. Use Xylitol derived from berries instead of corn. Does not spike blood sugar like honey or refined sugar. Prevents cavities, can be used as an alternative to flouride and has been proven to help ear and sinus infections. Not a great substitute to bake with. Use to sweeten cereal, hot drinks and yogurt. Substitute 1 cup for 1 cup ratio. Available at health food stores or online. Sucanat– is unrefined sugar cane juice that is dried until it crystallizes; retaining all the vitamins and minerals of the original product. It is fairly inexpensive. Sucanat is similar to brown sugar in look and taste and sweeter than refined sugar. Use 2/3 cup of Sucanat to 1 cup sugar. Does not melt well; may use in combination with other sweeteners: brown rice, barley malt or agave. Amasake– Oriental whole grain sweetener made from brown rice. Is thick with pudding-like consistency. Substitute 3 1/2 tablespoons Amazake base for 1 tablespoon honey or 2 tablespoons sugar. Use in breads, cakes, pancakes, waffles or muffins. Sugar Cane Juice– use in moderation as you would raw honey. Black Strap Molasses– is all the nutrition taken away during the refining process of sugar cane into white sugar. Use in the place of corn syrup. Turbinado sugar– is partially processed sugar. Often referred to as raw sugar. Corn Syrup– has very little nutrition and should be avoided. Splenda– research has shown Splenda to be an unhealthy sugar alternative. It is toxic and can indirectly lead to weight gain.